I was happy to accept Professor Andrew Morrison’s invitation to attend the Verdikt-conference on “Rock ‘n’ Roll Technologies” at the Rica Nidelvin Hotell in Trondheim, Norway this week. The conference was sponsored by the information communication technologies (ICT) arm of the Norwegian Research Council, and Morrison was presenting on outcomes of collaborative research that he and many colleagues and PhD students at Arkitektur- og designHøgskolen i Oslo have completed, in part with VERDIKT funding. The title of his presentation was “ Social Media and Design in Urban Environments,” and in three parts, he (1) introduced many of the projects conducted in the Institutes for Urban Landscape and Design at AHO, (2) argued for an updated understanding of “smart cities” that is better in line with incorporating humans and human–technology communication strategies into the urban, networked lanscape, and (3) featured one project, Satellite Lamps—constructed by three PhD students, Einar Sneve Martinussen, Jørn Knutsen, and Timo Arnall—as an exemplar in answering the research design question: How do we craftily design for the interactive city? In that project (which is part of the YOUrban project into social media, design, and the city), the students visualized the relationships between GPS geometry, urban space, and time by designing lamps that track, via lightbulb flickers, the presence and fluctuations of satellite signals. Their time-lapse video of these flickering signifiers into an otherwise invisible set of technologies and structures was an awe-inspiring conclusion to his presentation. Although the presentation time was delayed by some temperamental technologies (ironic, given the talk on the agency of the Internet of Things, which circulated throughout the conference), it was important for Professor Morrison to present his full program in order to convey to the mostly computer-science and engineering researchers in the room the importance of humanistic and social science research into ICTs. 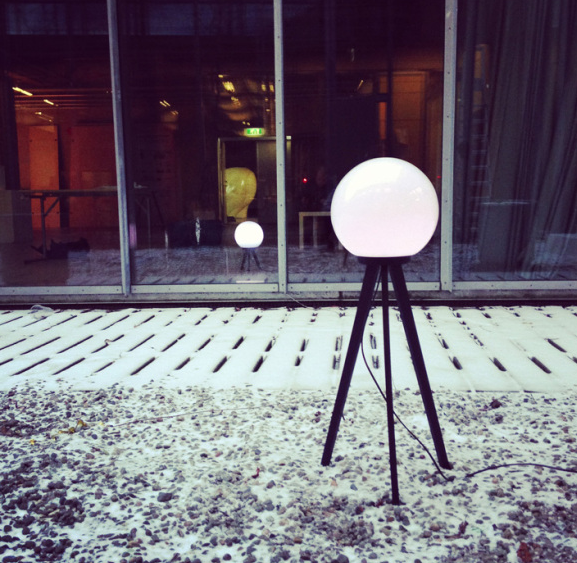 The importance this work adds to the technical and practical research of scientific fields reminds us that technologies are not deterministic; although in the Internet of Things, objects and technologies are theorized to take on some agency of their own, humans also interact with them and use these technologies in our world. Researching cultural and social implications to digital technologies and media helps both academics and the public better see—sometimes literally, as the case of the Satellite Lamps shows—how technologies work and can be worked in their daily lives. This question of importance (a by-product: a question of assessment and evaluation of such humanistic research) was a recurring refrain during the conference, and the questions we hadn’t time for in the session, such as these, were taken up afterwards by scientists who hadn’t previously known that humanistic research into ICTs was being conducted. 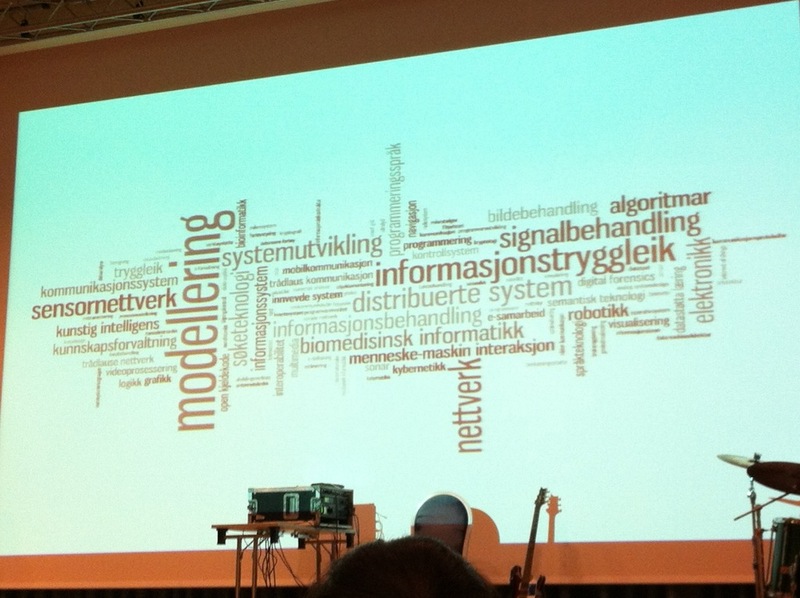 Word cloud, presented by Christine Hafskjold (Senior Advisor from Ministry of Government Administration, Reform and Church Affairs), on key terms in ICT research in Norway. Several of the plenary sessions on the second day of the conference focused on next steps in ICT research at the national level; that is, with the VERDIKT program entering its last year (ending in 2014), how would the Norwegian Research Council continue to support ICT research in the next decade, or even two? Possible names for the next program were bandied about, and although I missed the evaluation session of the VERDIKT program (again, ironically, to complete a proposal due that day to the NRC) that morning, several afternoon sessions spoke directly to the funding issues and research issues at hand. One talk in particular, that of Geir Øien, dean of the ICT, math, and electrical engineering departments at NTNU, touched on the role of PhD students in ICT programs, and the lessened funding that’s been offered in these areas for the last few years. 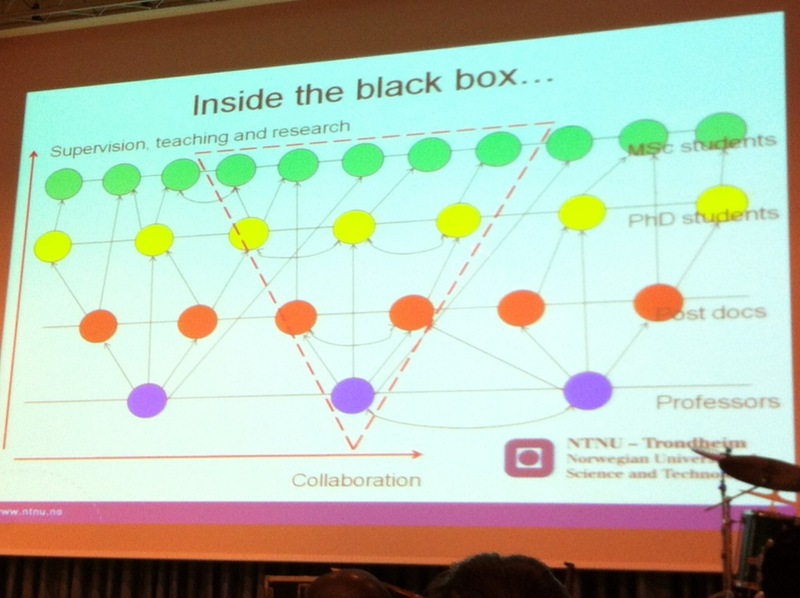 In part, Øien’s talk resonated with Morrison’s in that Øien opened the “black box” that often surrounds the amount of innovative research PhD students in ICT fields conduct. While Øien’s presentation showed the big picture impact of NRC (and other) funding to academic research and education of PhDs, Morrison’s presentation gave a dozen or more examples of ICT research conducted by PhD students (with their faculty advisors, in many cases). Taken together, these presentations—at the beginning and end of the VERDIKT conference—formed the perfect kappe for the importance of continued funding for PhD students and applied research in ICTs. Note: The featured image on this post is from the opening session of the Verdikt conference, a performance by Trondheim Electroacoustic Music Performance.